Sometimes I think it's okay to say... you know, what we did a while back was pretty damn good. Perhaps we should something similar again. Take the best of the past, moments that people connect with the brand, and combine it with the present and future to step forward. In a way, what Qantas have done with their latest campaign is exactly that. For years they had the amazingly powerful "Still Call Australia Home" campaign. One that became essentially a part of the fabric of the country, such that even when they changed the tagline - they still used the music. Then they changed it to something that was hugely epic, but basically felt like it was trying to be like every other airline, 'oh we're all about the customer'. It looked great but wasn't even a patch on where they used to be. The good news is that they have clearly seen sense. Whilst they haven't exactly brought back the old creative, they've essentially revamped it. Excellent decision. Instead of just well produced and good looking, what we have is engaging and moving. I find it hard to believe that any expat either in or from Australia wouldn't tear up when watching the full two minute version. I certainly did. An example of when using real people can be truly powerful. 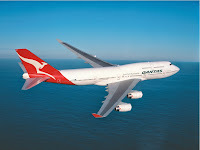 Qantas is never going to have the huge backing and budgets that the Middle Eastern/Asian airlines often get. On product and service it will always struggle to compete. But what it is starting to rediscover, is that a strong emotional bond is worth more than any product feature or discounted price. Going beyond patriotism and national pride to something far more powerful - memory, childhood, and the unmistakable connection we have as human beings to the places we call, and have called home. When I was planning my move to Australia, I would see the red tail fin of a Qantas plane and look forward to where I was going. This work makes me think about both where I am, and where I've come from. For a brand, that's pretty amazing - even if most people aren't expats... outside of Bondi anyway. Yup, that's lovely. I'll confess I could have done with one sweeping shot of the desert but still, it hit the spot. I love Qantas.